Scaling down from the amazing Vibe Shot, Lenovo announced another new phone today - the very affordable A7000, which still packs some surprises in its proverbial sleeve. Have you heard of Dolby Atmos? Well, the A7000 has it, and is seemingly the first handset to be equipped with Dolby's new surround sound tech for mobile. As Lenovo puts it: "Users will immediately hear the Dolby Atmos difference using headphones: sounds of people, places, things, and music become more vivid and move from all directions, including overhead, with astonishing clarity, richness and depth. Voices and noises have a broader range from highs to lows, with the greatest subtlety. The technology also makes playback volume more consistent across all types of content." 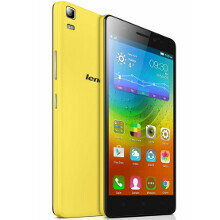 We'll check these claims when we get the handset for review, while the rest of the specs of the Lenovo A7000 include a brilliant 5.5" HD display with wide viewing angles, a 1.5 GHz MediaTek "true" octa-core processor paired with 2 GB of RAM, and 8 GB of storage plus memory card slot for more. Being a dual SIM device, the A7000 is equipped with two micro SIM slots, and offers 4G LTE connectivity, too. Photogs will be served by an 8 MP rear shooter with dual LED flash, and a 5 MP front-facing camera. Lenovo stuffed the 2900 mAh Li-Pol battery in a 7.9mm thin polycarbonate chassis in several flashy colors, making the weight of the 5.5-incher 140 grams only, which is a very good achievement. All in all, the company managed to create a fine device for the suggested $170 retail price, and the A7000 will be available, Dolby Atmos and all, as soon as this month in all markets where Lenovo has a foothold. It's basically a codec that presents a virtual surround setup. A "true" octa-core processor sounds like one of MTKs older processors. Meh.